(ACE Records) 26 Tracks - 1956-1963 - 12 page booklet. 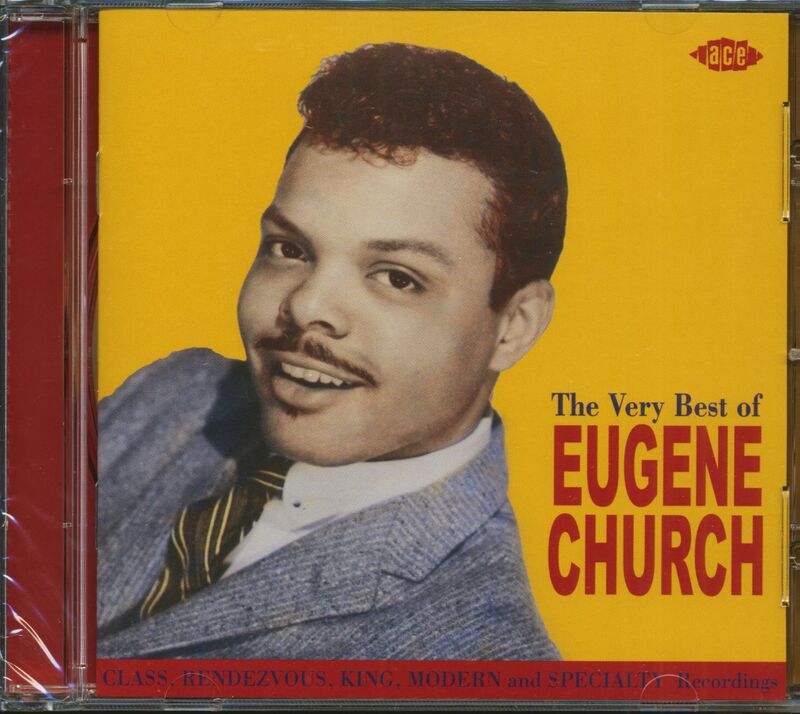 Incredibly, this is the very first album by Eugene Church, the epitome of cool West Coast R&B. We feature his four singles for the great Class label including the Hot 100 hits: 'Pretty Girls Everywhere' ('36 in 1958) and 'Miami' (#67 in 1959). Also the one single for Rendezvous and an unissued take of' 'Miami', all produced by Leon Rene. 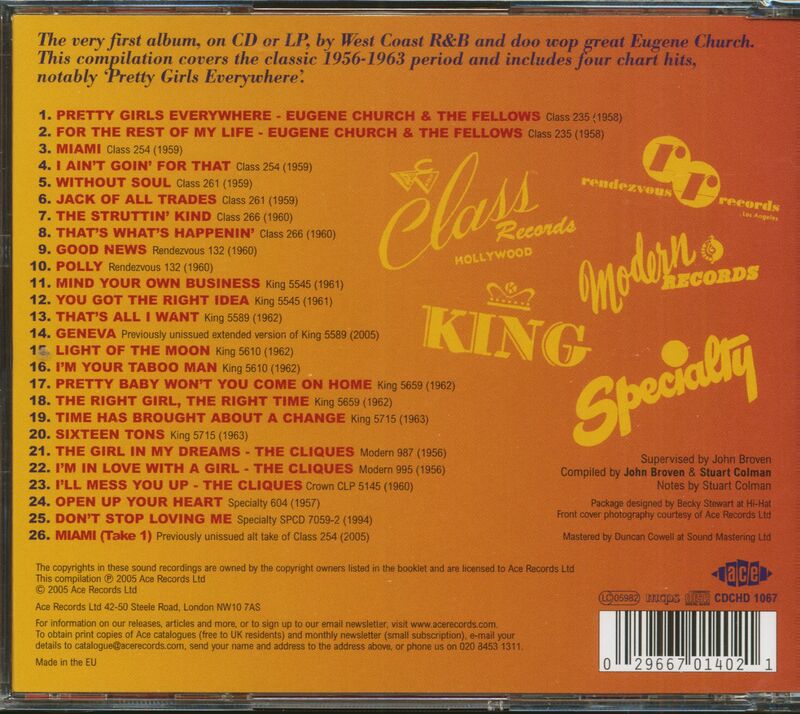 Included are Church's five King singles, which are almost unknown even though produced by Johnny Otis. There was one R&B hit for King, 'Mind Your Own Business' (#19 in 1961). The compilation is rounded off by Church's earlier recordings for Specialty and Modern (as the Cliques duo with Jesse Belvin, including the #45 pop hit 'Girl In My Dreams' from 1956). Will appeal to the many fans of classic R&B, Rock'n'Roll and Doo Wop. Eugene Church found plenty of inspiration to write his biggest hit on the streets of Los Angeles. While driving around Watts on a hot summer day with his roommate, fellow group singer Tommy 'Buster' Williams (formerly of The Pyramids and Gassers), Eugene noted all the young lovelies strolling the streets and channeled those tempting visuals into the irresistible Pretty Girls Everywhere. Born January 23, 1938 in St. Louis (his family moved to L.A. in the early '40s), Eugene fell in with the prolific and revered local singer Jesse Belvin, who had his hands in a great many R&B pies during the mid-'50s (they may well have sung on The Sheiks' Johnny Otis-produced original So Fine mentioned above). The two cut a 1956 duet, The Girl In My Dreams, that came out on the Bihari brothers' Modern label as by The Cliques despite Jesse and Eugene being the only two singers on it, and it hit regionally. They encored with a ballad, My Desire. Jesse sang background on Eugene's '57 solo single for Specialty, Open Up Your Heart. After completing the blueprint for Pretty Girls Everywhere, Eugene and Buster brought it to Bobby Day, who turned it down. But Leon Rene, the owner of Class Records where Bobby recorded Little Bitty Pretty One and Rock-in Robin, had immediate interest. The Fellows - an all-star studio-only aggregation - consisted of Belvin, Williams, Richard Berry, and Alex Hodge. 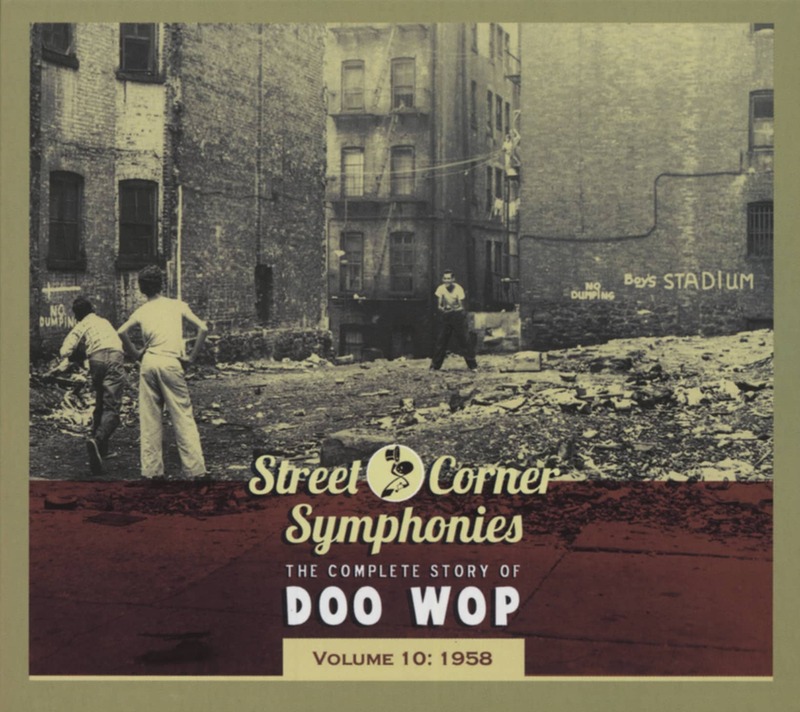 The rocking number, sporting an unusual baritone sax solo, was flipped with a ballad, For The Rest Of My Life, and pressed up on Class in September of 1958, where it took its time making a #6 R&B/#36 pop showing in early '59. Eugene made a similarly infectious Class encore, Miami, that cracked the R&B hit parade with a peak of #14 in the late summer of '59, but his fine rocking followups Jack Of All Trades and The Struttin' Kind flew under the radar. Rene moved Church over to Rendezvous, the label he'd founded with Rod Pierce, for Good News in 1960 before Eugene defected to King Records to work with Johnny Otis. There he nailed his last R&B hit in late '61 with a typically lively Mind Your Own Business. Eugene had five King 45s in all, seeping into 1963. With a surname of Church, it was fitting that Eugene became a minister, although he returned to make a '67 single for World Pacific. He was intermittently active on the L.A. oldies circuit prior to his April 16, 1993 passing. Customer evaluation for "The Very Best Of Eugene Church (CD)"